The Calgary Hitmen have had a long season. At one point, their season was hanging in the balance in early October, but they’ve have managed to turn their fortunes around and squeak into the playoffs. Calgary finished the regular season with a 36-26-5-1 record, securing the final divisional playoff position during the final stretch of the regular season, beating out rivals, such as the Medicine Hat Tigers, by two points in the wild card standings. Led by captain, leading scorer and Hitmen player of the year Mark Kastelic, the Hitmen began to find the win column more often as the season dwindled down, picking up 20 wins at the turn of the calendar. Goaltender Jack McNaughton was thrown into the fire and came out standing tall as the Hitmen rookie put up a 25-14-3-1 record with a 0.888 save percentage and 3.25 GAA. He is the first Hitmen rookie since 1990 to put up 25 wins in his first season. Calgary rode a long four-game losing streak heading into the playoffs, be it against the top two teams in the Central Division. 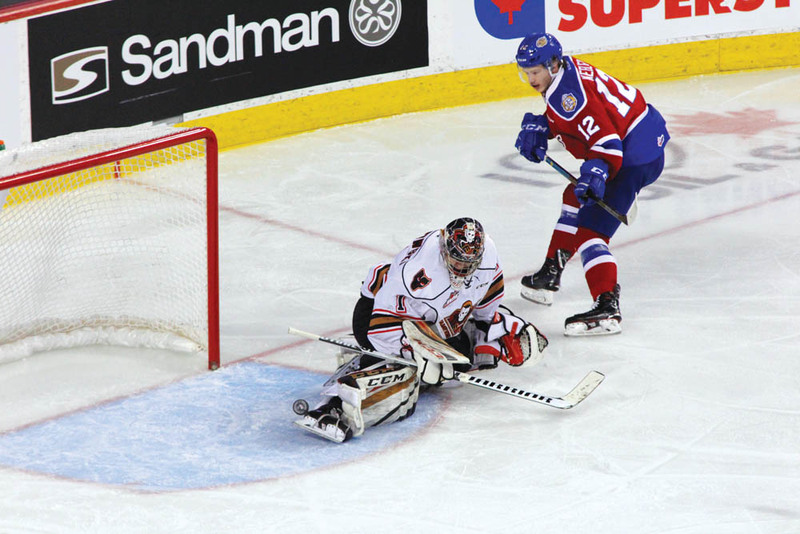 The Hitmen hosted the Edmonton Oil Kings in the final game of the regular season on Sunday March 17, at the Scotiabank Saddledome to conclude the rollercoaster season. The Hitmen came off a 6-1 loss to the Oil Kings in Edmonton the night before and were looking to bounce back against their provincial rivals, who will enter the playoffs as the Central Division champions. Riley Fiddler-Schultz opened the scoring for the Hitmen in the first period, but the Oil Kings bounced back with a pair of powerplay goals in the second. An empty netter with 25 seconds left sealed a 3-1 victory for the Oil Kings. Despite the loss, the Hitmen are now focused on their first round playoff matchup with top contender the Lethbridge Hurricanes. The Hurricanes finished second in the Central Division, only one spot ahead of the Hitmen. However, the Hitmen struggled against Lethbridge all season, going 1-5 against the Hurricanes. Hitmen head coach Steve Hamilton believes that the regular season results don’t matter once the playoffs begin. Hitmen forward Kaden Elder knows that the team has the ability to keep up with the Hurricanes in the playoffs. “They’re a fast team, but we’re just as fast. We’re definitely at their caliber. If we work hard, good things will come to us. We’re a young team, but we know how to play,” says the graduating 20 -year-old forward. Game one of the series starts on Friday March 22 in Lethbridge. The series returns to Calgary for games three and four on March 26 and 28.